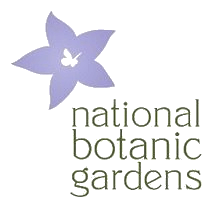 The National Botanic Gardens has been in existence for 212 year, and for the first time in its history it has established a gold medal (right). The medal will be awarded, on an irregular basis, to those members of the Irish botanical community who have made a significant contribution to Irish Botany. Paddy Reilly shows his delight at being awarded the first National Botanic Gardens Medal by the Director of the Gardens, Peter Wyse Jackson (right), looking on is Matthew Jebb (Middle) Paddy Reilly was the recipient of the first medal, which was presented to him, during National Science week, at a small ceremony in the Director’s House on the 16th November, in front of a crowd of Paddy’s friends and relations. In presenting the medal, Peter Wyse Jackson, the Director of the Gardens, mentioned Paddy’s achievements in completing a number of significant floras, including that of the Phoenix Park (1993), the grounds of Maynooth College (1995), the Flora of County Cavan (2001), as well as his significant contributions to the Flora of County Dublin (1998). Matthew Jebb gave a short eulogy on Paddy’s role as an “Amateur Botanist”. He explained how the term botanist was originally coined by the naturalist John Ray from the Greek root word botane, meaning a knowledge of plants for fodder, literally the work of a shepherd; one who must safely graze his flock, and in doing so must understand not only the taxonomy of plants – which are edible, which are poisonous – but also their virtues and habits; where they grow; their ecology; the geology and geography of a region; as well as history and local knowledge. These skills are what make a good Botanist, and Paddy has excelled in them. The National Botanic Gardens Medal, obverse Matthew went on to describe how the term “Amateur” has also become debased in modern usage. The true meaning is of one who undertakes a study for the sheer love of the work. And Paddy’s output in the past 15 years has been a labour of love. Not only marked by the floras listed above, but by numerous other scientific publications, herbarium specimens and tens of thousands of detailed records of plant sightings over many years. This body of work, which Paddy has deposited at the National Herbarium, represents a significant and enduring contribution to Irish Botany. While President of the Dublin Naturalists’ Field Club, Paddy organised a joint Field Club Meeting, with the Belfast Naturalists’ Field Club, the first since Praeger’s day at the turn of the 19th Century. His role in promoting field Natural History in this way has been significant in ensuring that the next generation of “Amateur Botanists” will be able to carry on the work he has so nobly undertaken. The National Botanic Gardens of Ireland are an oasis of calm and beauty, and entry is free. A premier scientific institution, the gardens contain important collections of plant species and cultivars from all over the world.